Recommended as a source of probiotic microorganisms (lactobacteria), proanthocyanidins, as well as an additional source of vitamins C, E, selenium and zinc. Recommended for adults to take 2 capsules (one in the morning and one in the evening) per day during meals with water. Course of administration—1 month. Minimal recommended course of administration of probiotics—10 days. Keep at room temperature (not exceeding 230C) in a dark dry place out of reach of children. Suppresses growth of opportunistic pathogenic microorganisms. 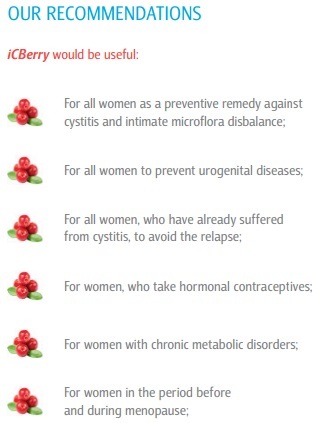 The innovative product iCBerry has a unique formula that contains lactic acid bacteria—Lactobacillus acidophilus(dominating microorganisms in the vaginal flora of a healthy woman) and cranberry extract—No 1 remedy against cystitis in the world. 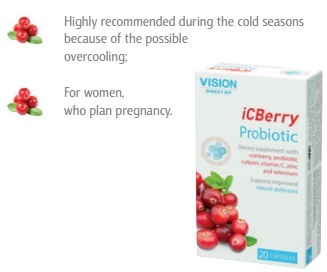 Cranberry extract is the most effective remedy for comprehensive treatment of cystitis and prevention of its relapses. Probiotic cultures can help restore microflora and prevent female gynecological diseases, such as cystitis, vaginosis, uterine cervix inflammation. Patented PPM® (Probiotic Preservation Media) technology allows to preserve steadiness of probiotic cultures. Currently the market can’t boast of a steadier probiotic product formula. Read more about Women Health here and how this unique product maintains it for us.